Ylwa and Tobias, charismatic stars of the Norwegian documentary Tongue Cutters (Tungeskjaererne). “Small children, big knives.” That’s one of the tag lines for the Norwegian documentary Tongue Cutters. There are some scary spikes, too. And forklifts zipping back and forth. Ylwa, 9, leaves Oslo for two weeks to stay with her grandparents in Myre, northern Norway. At a fish processing plant there she will learn to cut cod tongues just as her mother and her aunt (the film’s director, Solveig Melkeraaen) used to do. Tobias,10, is already an old hand at it, and he shows Ylwa how it’s done. The first day, she can’t even bring herself to try it, but as the end of her stay nears, she’s ready to enter the “world cod-tongue cutting competition.” Is that “world” as in “World Series?” Does anyone from outside Norway enter? Ylwa and Tobias are such likeable characters I enjoyed watching and listening to them, whatever they were doing. They goof around with his hover board, talk about pets and the hassles of having parents who are divorced or separated. They act like the camera isn’t even there. Tobias Evensen and Ylva Melkeraaen Lundell in Tongue Cutters (Tungeskjaererne). Ylwa is a big sushi fan and she’s disappointed that Myre doesn’t have any sushi restaurants. When she was still in Oslo, she was astounded to learn that sushi was not available when her mother was her age. “How did you survive, and not die?” she asked theatrically. 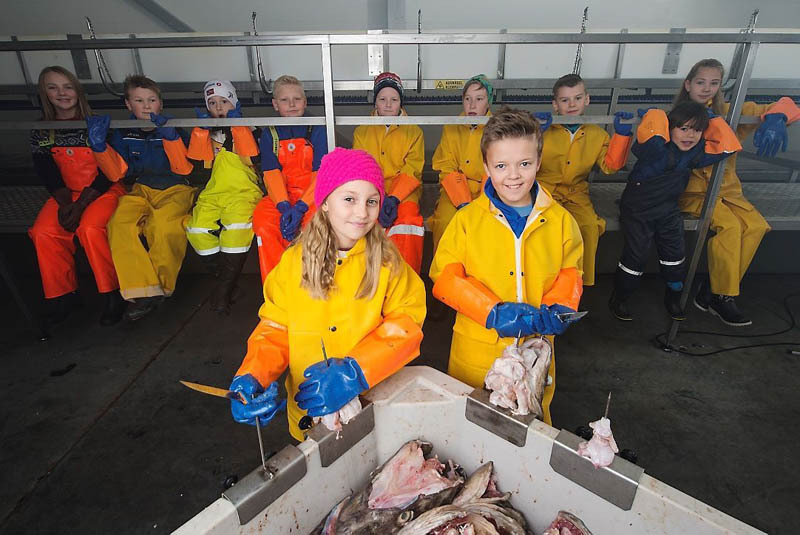 Nowadays, boys and girls cut cod tongues to earn some spending money, but many years ago, when times were harder, a young boy might have to leave school to do it full-time to help support his family. Archival photos from that era show us what life was like back then. RIDM (Rencontres internationales du documentaire de Montréal) ends on Sunday, Nov. 19, 2017. Visit the RIDM web site at ridm.ca for more information. Previous Post RIDM 2017 Review: Do Donkeys Act?